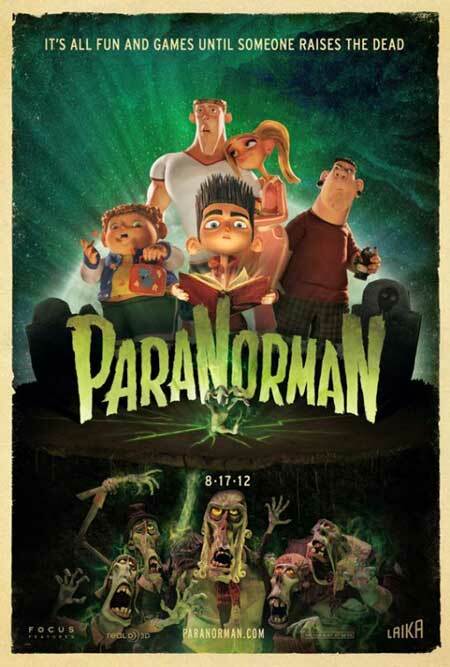 A few months ago I was at the movies with my 11 year old son (Lil’ Black Saint) and we saw the trailer for “ParaNorman“. From that moment forward we anxiously awaited it’s release as it looked like it was going to be a real hoot. 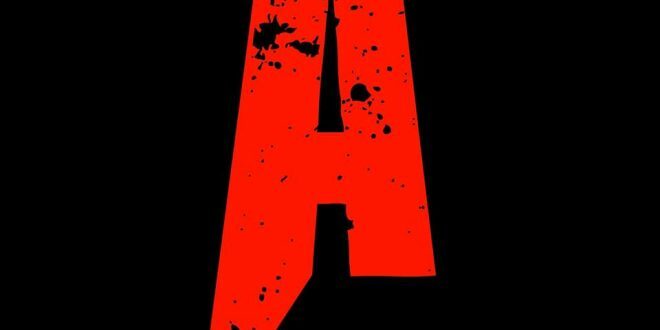 But as it got closer to be released I began to worry, we’ve been deceived by some really well put together trailers only to get burned when we witnessed the full feature. 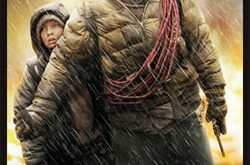 I so wanted this movie to be everything it seemed to be not only for myself but for my boy because he became especially besotted by the trailer. 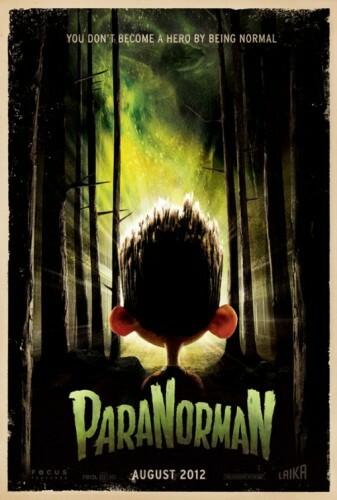 “ParaNorman” is about a boy (Kodi Smit-McPhee) who has the ability to not only see the dead but to speak to them as well. Of course this makes him sort of an outcast both at school and at home. The kids at school mock him so much that he keeps a rag & spray cleaner in his locker to wipe away the names he finds written on it every day. At home, his father, Perry (Jeff Garlin) thinks he’s weird and his sister, Courtney (Anna Kendrick) finds him both weird and annoying. His mother, Sandra (Leslie Mann) is sympathetic but also thinks that Norman is an odd bird. But his grandmother (Elaine Stritch) loves & watches over him…it’s too bad she’s dead & only Norman can see her! Norman has adjusted to his status as the resident “Weird Kid” in town though. He prefers to keep to himself and his only real friends are the ones no one else sees but him. There’s a wonderful scene where we follow Norman as he walks to school and he greets a motley crew of pea green specters who happily greet him in return but the townspeople just see him talking to nobody as he ambles down the streets to school. 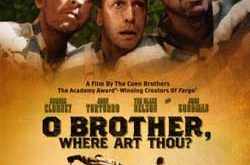 Norman doesn’t know that he’s being followed by the only person who’s more of an outcast in the town than he is, Mr. Prenderghast (John Goodman). Prenderghast has his eye on Norman to fulfill a destiny that Norman has no idea is about to take place. 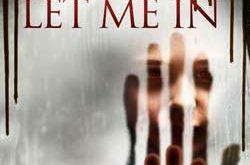 A destiny that involves a witch’s curse on the town and a group of….zombies! Along the way, Norman makes a few friends despite his efforts to be left alone. And as it turns out he’s going to need each of them to help him in his quest to stop the curse before it’s too late. 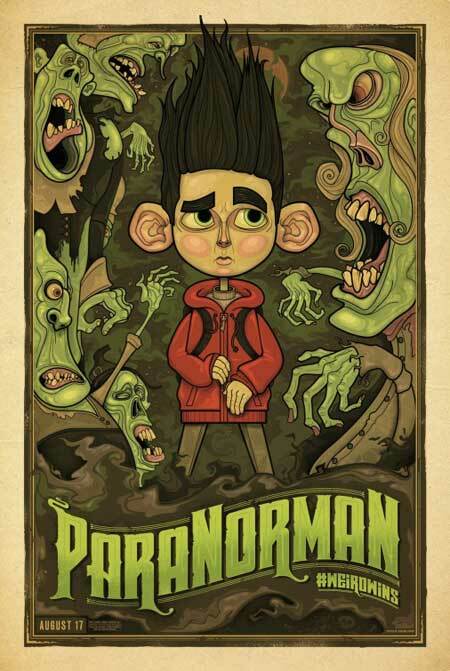 But “ParaNorman” is more about relationships & how people can be misunderstood for what they look and sound like rather than who they really are inside. And while that might sound like it’s corny, it isn’t. Actually it’s one of the most heartfelt & sincere films I’ve ever seen dealing with that subject. All of the monstrous hi-jinks are just gravy…deliciously gruesome gravy. 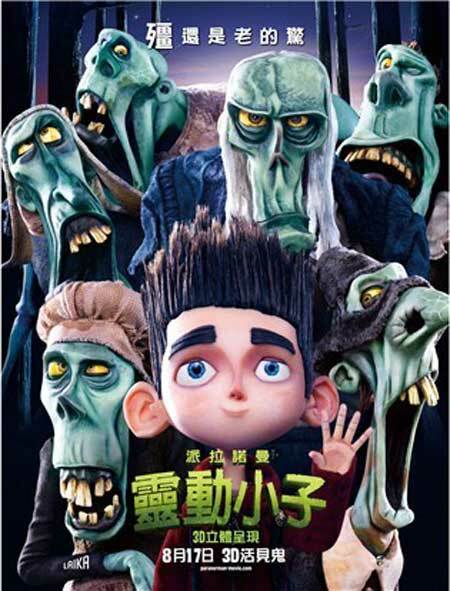 But none of this would work if it didn’t look good and the makers of “ParaNorman” have made sure that they didn’t fail in producing one of the most visually arresting animated films I’ve ever seen. The production design is (For lack of a better word) otherworldly with particular emphasis paid to detail. Norman’s room is a zombie film lovers delight with his alarm clock, wallpaper, sheets, slippers and even his toothbrush festooned with some type of gruesome zombie details. Actually the entire town is designed in a sort of “Caligari” style with everything in it being slightly askew & surreal. There is some excellent use of shadow and light going on here and that’s not something I’m used to seeing in an animated film. And as the film gets creepier it looks creepier as well, wait’ll you see how the witch first manifests herself and you’ll know what I mean. It’s also chock full of homages to horror films as well. It’ll take a few viewings to catch all of them but that’s all part of the fun. “Scooby Doo” is also given a big “Thank You” from the filmmakers. The animation was very reminiscent of the old Rankin-Bass TV productions of the late sixties and seventies to me. Obviously it looks a lot better than those classics did but look at the way water is animated here then think back to favorites like “Mad Monster Party” and you’ll see the resemblance. But the stop motion animation here is of the highest caliber, it feels old school but it looks and moves as smooth as butter. And the character models have just that…character. Norman’s eyes are particularly deep & engrossing (One of them is seemingly dilated, another example of the detail in the film). The voice acting is absolutely spot on perfect also. The line readings come off as very familial and not forced. Special kudos must go out to both McPhee & Tucker Albrizzi who plays Neil, a short, rotund kid who sees the joy in small things and teaches Norman to see them as well. There’s a great scene in which Neil asks Norman if he can see his long dead dog Bub. When Norman tells him that he can Neil immediately picks up a stick and begins to play fetch with Bub even though he can’t see him. As Neil continues to play with the stick Norman realized that just the idea that Neil is playing with his beloved dog is enough for him, and the joy that Neil expresses from that idea is nothing to be ashamed of and it humanizes Norman just a bit since up to this point he is something of a wet rag. Directors Chris Butler & Sam Fell have created an instant classic here. 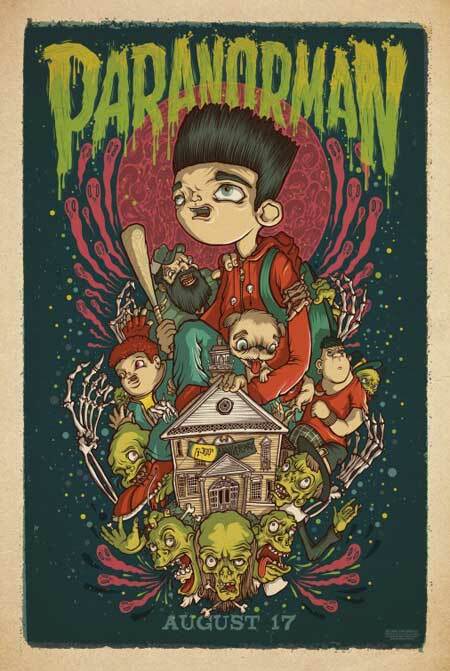 Not only is “ParaNorman” one of the best films of the year but it’s the best animated film I’ve ever seen. It’s one of the most entertaining films you’ll see this year hands down with laughs, scares & screams all doled out in equal amounts! Wrap that package up with great voice acting, a wonderfully dour musical score and amazing production design and you have one hell of a night out at the movies! They even managed to get Dizzee Rascal’s epic track “Fix Up, Look Sharp” in here during a hilarious break dancing scene, How friggin’ cool is that? 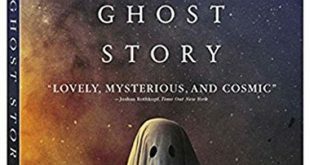 My son and I were not disappointed (He just said “Wow” when I asked if he liked it) and you won’t be either. 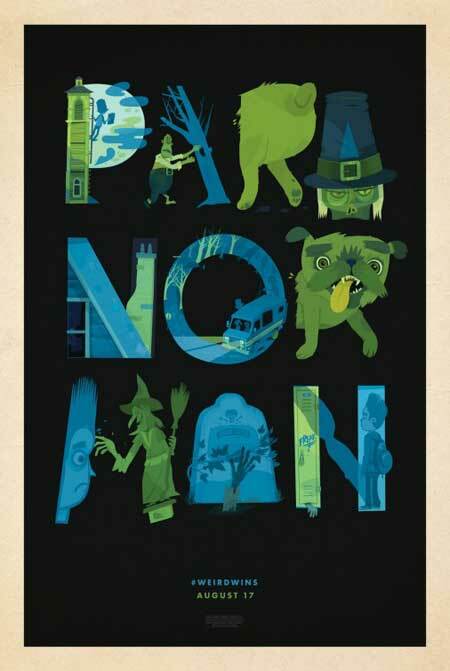 Five shrouds out of five for “ParaNorman”…just a flat out awesome movie. BTW…hang around after the end credits roll for a cool little scene that has nothing to do with the movie but will endear Norman to you all the more! Wow. 5 Shrouds? Cool. I can’t wait to see this. I love the way the movies looks. Like you mentioned it resembles the old Rankin Bass TV shows. That is enough to sell me on it.